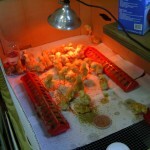 The chickens first start out in the brooder. They spend several weeks here until they get their first feathers. 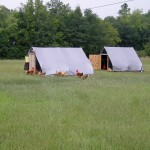 Then they can be moved to the movable chicken tractors. Yes these chickens do look funny, but they are suppose to look this way. These are Naked Neck chickens and I guess you can tell how they got their name. We think they are one of the best chickens to raise on pasture. They are excellent foragers and do well in extreme cold and heat. This breed is very slow growing, but it is worth the wait. If there was such a thing as fillet mignon chicken the Naked Neck would make the grade. These are Red Ranger chickens. This is another good choice for a pasture raised chicken. They are still slower growing than the commercial Cornish Cross (the white chickens most producers raise in confinement) and since they grow slower we have not had any leg problems or other health issues. 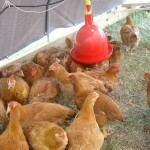 They are faster growing than the Naked Neck chickens and that allows us to have a better delivery schedule. Because they grow faster they consume less food and that allows us to charge a little less for them. The chickens live in movable houses called chicken tractors. Every day the tractors are moved forward so the chickens can get fresh grass and bugs. It is a scary place to be if you are a grasshopper in a chicken tractor. The chickens love to eat grass, something they do not get in most large chicken houses, and they help to keep the insect population down. The most important byproduct from the chicken is the manure. 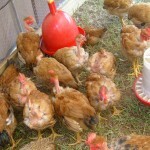 Rather than using synthetic fertilizers the chickens deposit manure on the field and the result is lush grass.